CSS3 is the latest version of CSS, the stylesheet language used to control the presentational layer of web. CSS3 is the latest version of css, the stylesheet language of web. 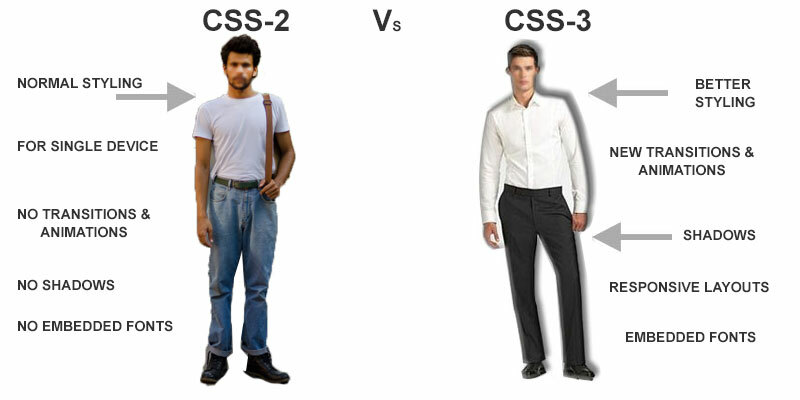 CSS3 includes both CSS 2, CSS 2.1 ( previous version of css) and CSS3 specifications . CSS3 is the third level of CSS specifications. CSS3 includes some new features, like new CSS3 selectors, rounded corners, box shadows, RGBA, HSL and HSLA colors, box sizing, Opacity, CSS3 Gradients, transitions, transformations, animations, multi-column layout, flex-box, embedded fonts and Responsive web design . Here are the new features in CSS3. As CSS is a part of HTML5 now, we have to use CSS for all style related changes. We can't use HTML presentational Attributes for styling, like, align, valign, color, bgcolor etc, and presentational tags like center, font, big tags etc. CSS3 includes all specifications of CSS2, CSS2.1 and CSS3. Here are some new features in CSS3. Here is a list of css3 features. Multi Column layout Create multiple columns layouts. @media Condition based CSS to create Responsive layouts. CCS3 introduced some new units for font size. These units are vw, vh and vmin. Viewport width or Viewport height are related to device viewport. They even increase or decrease if browser's window size is changed. 1vw = 1% of viewport width. 1vh = 1% of viewport height. 1vmin = 1% vw or vh, whichever is smaller. 1vmax = 1% vw or vh, whichever is larger. This is a paragraph with font size 2vw. CSS3 is supported in html5 based browsers only. IE 8 and lesser doesn't support CSS3 and its features. IE 9 Supports CSS3, but not fully.. Some features are missing. But IE10 and above, Edge, Chrome 4, Firefox 4, Safari 5.1 and above browsers supports css3. For better user experience, please use latest browsers. To Avoid cross browser compatibility of css3 based properties in latest and old browsers, user vendor specific prefix.